climate change is triggering widespread outbreaks of diseases among wildlife along with spreading tropical diseases in human habitations previously unaffected by them. These were the findings of a comprehensive two-year study conducted by National Centre for Ecological Analysis and Synthesis (nceas), a California-based research institute. The study is the first to analyse disease epidemics across the entire plant and animal systems, both on land and in the oceans. Frosts and cool periods can cut insect, parasite and fungus pest populations by up to 99 per cent. But global warming has resulted in mellow winters that are followed by long spells of warmth and humidity. Such climatic conditions are providing perfect conditions for the survival of disease parasites. To provide scientific evidence for this alarming situation, the nceas research team used hotspots of El Nio -- the dramatic cyclic increase in the warmth of the tropical Pacific Ocean that also affects African and American climate patterns -- as a guide to climate trends. 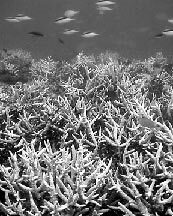 They found that during the unusually warm El Nio year of 1998, there was a massive deaths of corals in many parts of the world. Oysters of Maine in the us had been blighted by parasites normally restricted to more southerly waters. Lions in Africa's Serengeti had suffered canine distemper, and cranes, vultures and even wild American ferrets had been hit by disease outbreaks. The monarch butterfly also came under pressure from an exploding parasite population. Furthermore, incidences of the rift valley fever, a devastating viral illness of cattle and humans, also increased during 1998. Recently, a large-scale coral bleaching incident, which too has been linked to global warming, occurred off the Heron island located in southern side of Australia's Great Barrier Reef. According to the researchers, in a warmer world, such events could occur more regularly: viruses in the mosquito population would multiply and so too would the mosquitoes. They also fear that the spread of tropical infections to temperate zones could have even more calamitous effects. The tropics, compared with other geographical regions, have a richer variety of species and fewer individuals in each species. Moreover, diversity acts as a buffer to the spread of diseases in this area. In contrast to this, temperate zones have a smaller range of species, with greater numbers in each. Therefore, pathogens moving into temperate zones would not result in species becoming extinct, as they exist in abundance. "We have to get serious about global change. It is not only going to be a warmer world, but a more sick world," says Drew Harvell lead author of the study from the us-based Cornell University. According to Andrew Dobson, a co-author of the study from Princeton University, usa, human destruction of biodiversity makes this a double whammy. "The number of increases in disease incidences is astonishing and quite alarming," says Richard Ostfeld, a co-author of the study.